The last couple weeks have been full of QCR projects – quilting my Metro Rings (fingers crossed will be done this weekend! ), putting together and a post for my stop on the Quick Curve Ruler Blog Hop (tune in tomorrow! ), and lastly, putting those Metro Ring scraps together into some sort of simple top. One of the great things about cutting curves with the QCR is that all curves match. Thus, all the bits left over from the ring segments could be pieced back together into a little something. 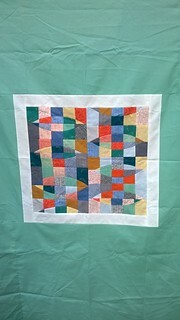 Once I had the block, which measured around 19” x 19”, I bordered it with the white crosshatch from Botanics and floated it on a field of Kona Aloe. I’m calling it Tossed Almonds; wouldn’t an entire top using that technique be something? Right now, it’s a smidge larger than 60” x 60” and I’m debating trimming it down to crib size. Pros: more focus on center block. Cons: will no longer be throw-sized. Thoughts? Oh, that is a tough call. 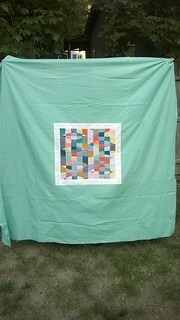 I love throw quilts, but I think the pattern would stand out more if it were trimmed down a bit. Any way to trim it and use the trimmings to make a backing? I agree, tough call on the trimming, but I think it’s to much aloe color and it’s pulling attention away from the center. On another note, it’s super cool the scraps go together like that.